I can totally see Kylo saying "You're not a Jedi yet" to Rey when they face off on the cliff. C3PO screaming in the Millennium Falcon cockpit as they're dodging asteroids will never stop being my fave scene from ESB. OK RotJ, give Leia credit for the most bad a** entrance as a bounty hunter with demanding additional money and threatening to set off a bomb if Jabba doesn't comply. His comment that her bounty hunter alter ego is "fearless and inventive" is gonna come back when she strangles the gigantic slug. 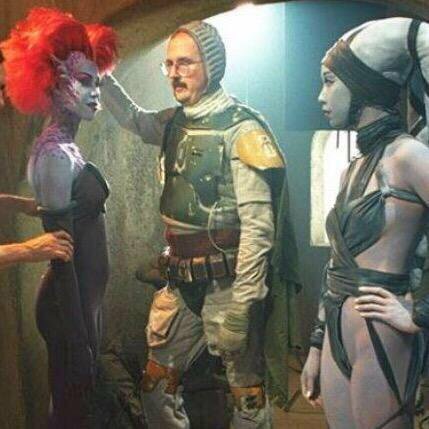 I hope Boba looks like this to people who ignore the PT entirely. If Phasma is supposed to be the new Boba Fett, she looks a lot better under the armor than that guy. So other details from RotJ - the whole detail with Luke surrendering to the Emperor with dialogue about "completing your training" sounds pretty familiar. Again have to wonder if this will be brought up in the "whatever happened at Luke's dodgy charter school" backstory. There's no WAY that I see Rey being that calm/zen if she's put in a similar situation.